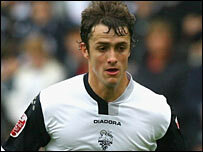 Stoke City manager Tony Pulis has finally landed long-standing transfer target Danny Pugh. The Preston winger, 25, has joined the Potters on loan until January with a view to a permanent deal. North End rebuffed a previous approach for the ex-Manchester United and Leeds player but are now ready to let him end a 16-month stay at Deepdale. "I am absolutely delighted to have signed a quality left-sided player," Pulis told Stoke's website. However, Preston boss Paul Simpson told his club's website: "It was in everybody's best interests to let him go. "Danny said he wanted to go and play on loan. I said he couldn't, then yesterday (Thursday) he handed me a written transfer request. "Although I'm not someone who is going to be dictated to by transfer requests, I reluctantly allowed him to go because I was at a point where I had a footballer who didn't desperately want to be here. "He did a very good job for us last year, but this season he hasn't been as effective and now I've got other players who are playing ahead of him at the moment.